The right home decor makes a huge difference in how you feel while you’re inside. Soft colors, like pale blues and creamy whites, create a peaceful vibe for bedrooms, while standout modern art and loud hues like cherry red get your creativity up and running in a home office. However, plunking down your hard-earned cash on just one classy painting seems counterintuitive if your space is constantly evolving. 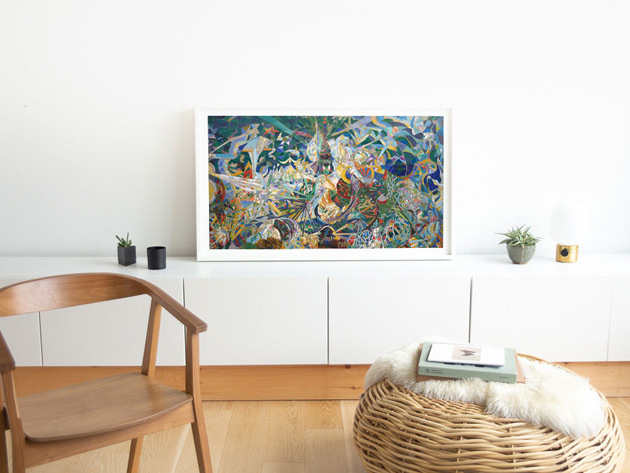 The Depict Frame 4K Digital Canvas brings museum-quality imagery to your home, and a one-year subscription to their premium service provides access to more than 600 show-stopping works. This 46x28” digital canvas lets you rotate through different works of art in stunning 4K resolution. You can choose from hundreds of works in Depict’s vast collection of imagery, and you can switch from a wide landscape piece to a striking vertical painting by physically swapping the frame’s orientation. The sleek wood frame and mat add a classic edge to this tech-savvy decor, and the images all have a matte finish to reduce glare and enhance viewing quality. Best of all, with this package, you’ll receive a one-year subscription to Depict Premium, which houses everything from classical paintings to modern media in one user-friendly app. Buying enough art to suit your every mood can cost more than you’d imagine, but you can get Depict’s 4K Digital Canvas and a one-year subscription to Depict Premium right now for only $1,099.